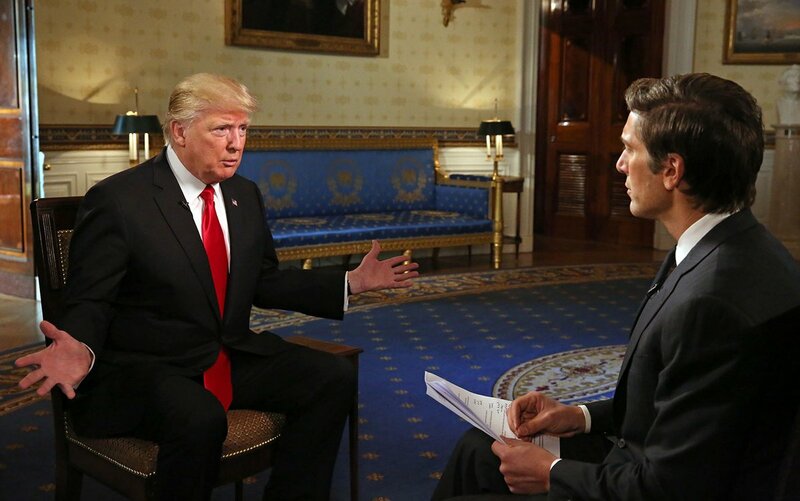 In the interview with ABC's David Muir, the narcissist-in-chief couldn't stop obsessively returning to the topic of his perceived grudges over inauguration crowd size, his vote count in the election, even his appearance at CIA last week, roundly criticized by those at the agency. Trump didn't get the memo. "In fact, they said it was the biggest standing ovation since Peyton Manning had won the Super Bowl and they said it was equal," he lied. In the rambling and deeply unsettling interview, the obviously deranged Trump says torture is a viable interrogation option in his war against ISIS. Trump also said his presidential campaign was “one of the greatest victories ever;” he defended his bizarre CIA speech as “a home run;” and he criticized “unflattering” and “demeaning” portrayals of his inauguration crowd size by the very bad and unfair media. Sad! Narcissistic word salad. What the heck, man. MUIR: You say you're going to launch an investigation into this. MUIR: What you have presented so far has been debunked. It's been called false. TRUMP: No it hasn't, take a look at the Pew reports. TRUMP: Excuse me, then why did he write the report? According to Pew report -- He is groveling again. You know, I always talk about the reporters that grovel when they write something that you want to hear but not necessarily millions of people want to hear, or have to hear. MUIR: So, you've launched an investigation? TRUMP: We're going to launch an investigation to find out. And then the next time -- and I will say this, of those votes cast, none of them come to me, none of them come to me. They would all be for the other side. None of them come to me. But when you look at the people that are registered, dead, illegal, and two states, in some cases, maybe three states. We have a lot to look into. Let me just tell you, you know what’s important, millions of people agree with me when I say that if you would’ve looked on one of the other networks and all of the people that were calling in they’re saying, ‘We agree with Mr. Trump. We agree.’ They’re very smart people. Earlier today, various news organizations reported that several top figures in the Trump political regime are registered to vote in multiple U.S. states. Steven Mnuchin, Steve Bannon, and Donald's daughter Tiffany Trump. They shouldn’t be very worried. They are here illegally. They shouldn’t be very worried. I do have a big heart. We’re going to take care of everybody... here you have great people that are here that have done a good job, they should be far less worried. It is carnage. It’s horrible carnage. This is Afghanistan — is not like what’s happening in Chicago. People are being shot left and right. Thousands of people over a period — over a short period of time. Absolutely I feel it works. Have I spoken to people at the top levels and people that have seen it work? I haven’t seen it work. But I think it works. Have I spoken to people that feel strongly about it? Absolutely. We’re talking about — no it’s not the Muslim ban. But it’s countries that have tremendous terror. . . . it’s countries that people are going to come in and cause us tremendous problems. Our country has enough problems without allowing people to come in who, in many cases or in some cases, are looking to do tremendous destruction. Trump was asked about health care in the interview. Will Americans who have health insurance now all still have insurance after the Affordable Care Act is repealed? Here’s what I can assure you, we are going to have a better plan, much better health care, much better service treatment, a plan where you can have access to the doctor that you want and the plan that you want. We’re gonna have a much better health care plan at much less money.